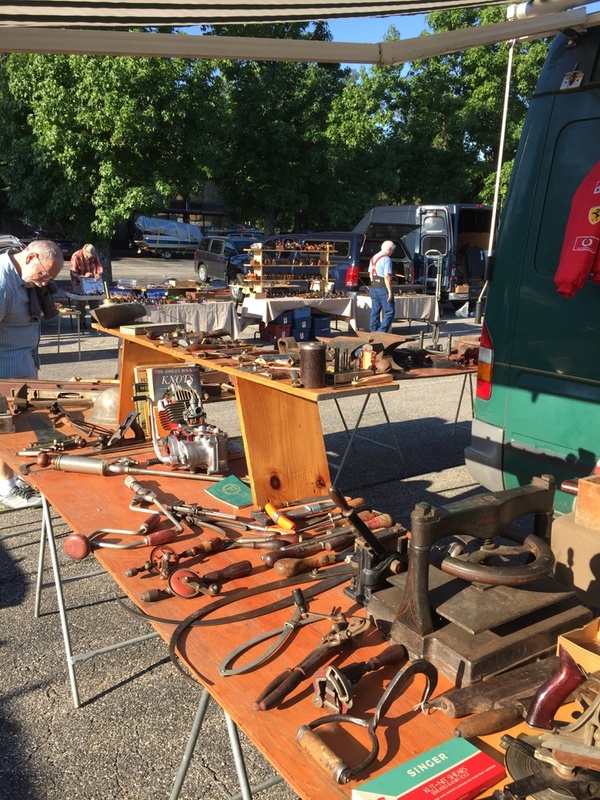 If you love old tools, the Nashua Tool Show is always the place to be. I used to get up at dawn and drive up from MA, but the past few years living in Merrimack, NH I’ve been lucky as the show is on my way to work so I can go extra early on Thursday and Friday morning before work. 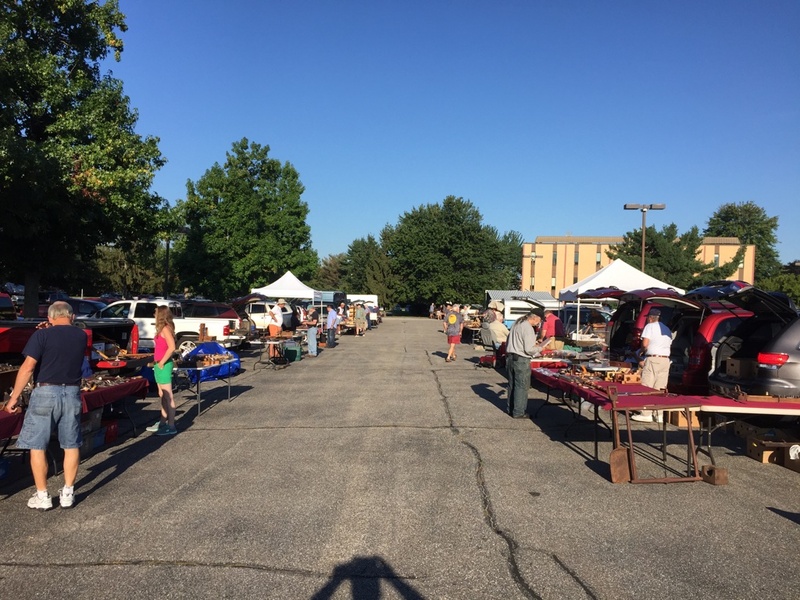 A sampling of some of the wares you’ll find out in the parking lot. The first of three aisles of vendors out in the parking lot. The first aisle closest to the hotel is where all the high end tools tend to live. The closer you get to the highway the more likely you’ll find a deal or a diamond in the rough. As a user more than a collector I do tend to buy from the vendors in the middle aisles. An almost Studley looking workbench. 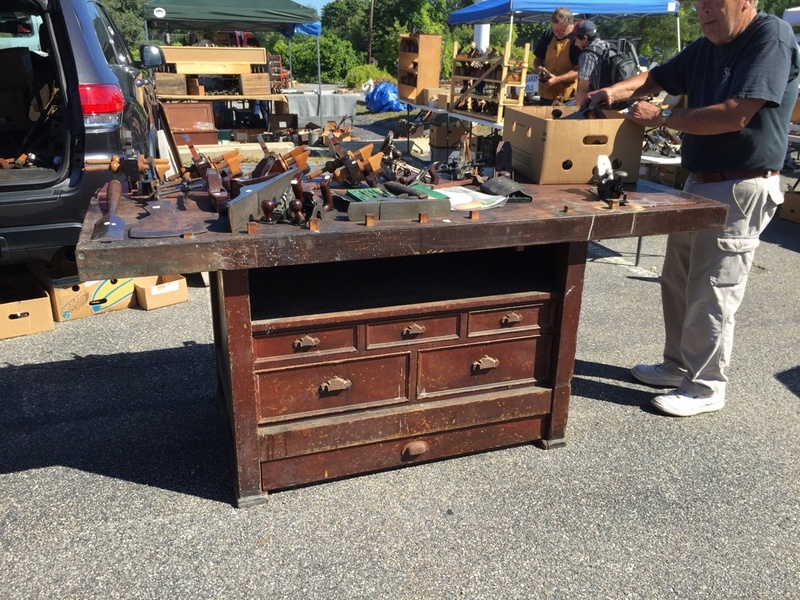 The seller said it was the first bench like this he was able to get in 30+ years of selling tools and that it had vises very similar to those on the Studley workbench. He also sold it at the show to another collector for a good amount of money. Above is a great looking bench that had a vaguely Studley look to it. Apparently it also has vises with very similar hand wheels. The seller mentioned Don C. Williams book on Studley and said he was searching for a bench like this for the past 30+ years. Given the hunt I thought it was interesting that he already sold it to someone else for a pretty penny. I hope it gets cleaned up and back into service for the lucky person who picked it up. 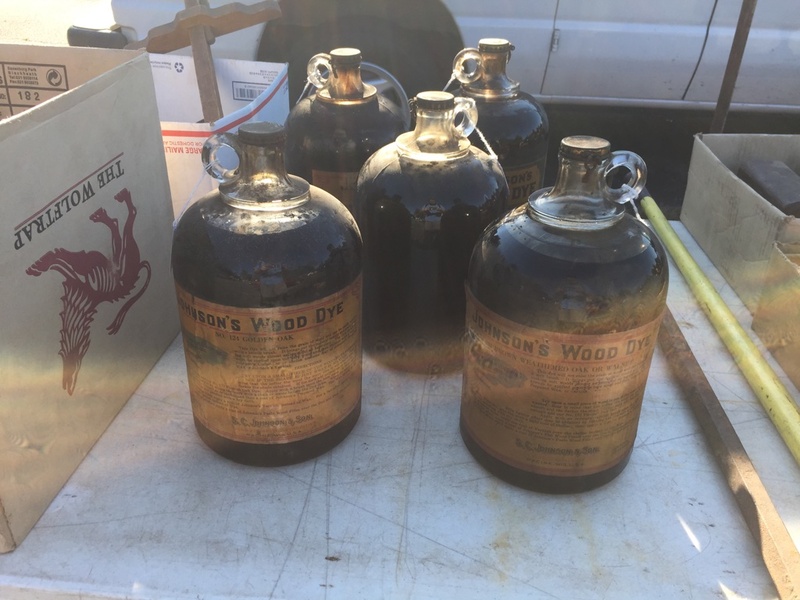 Above are some old and still sealed gallon jugs of Johnson’s Wood Dye. 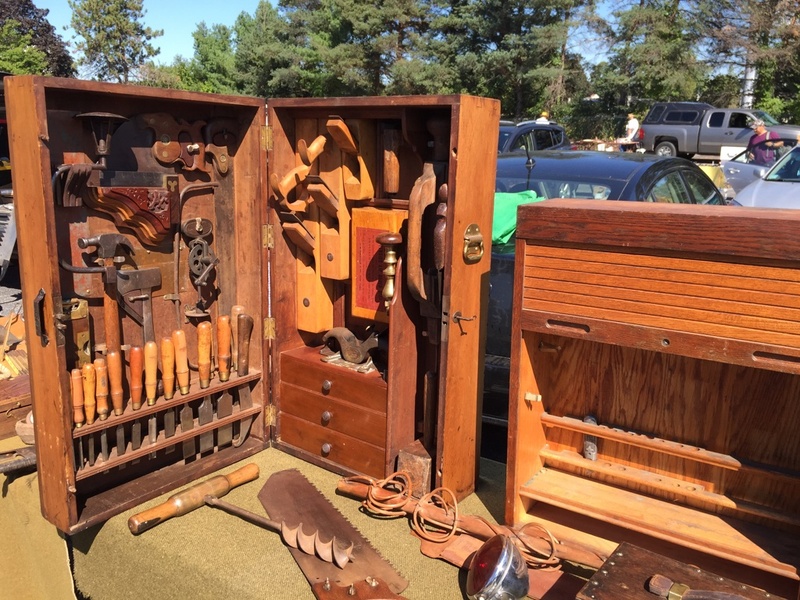 An interesting tool chest for sale with LOTs of round headed screws for decoration and as part of the construction of the chest. The carcass was dovetailed and the screws seemed to be backup support and decoration. 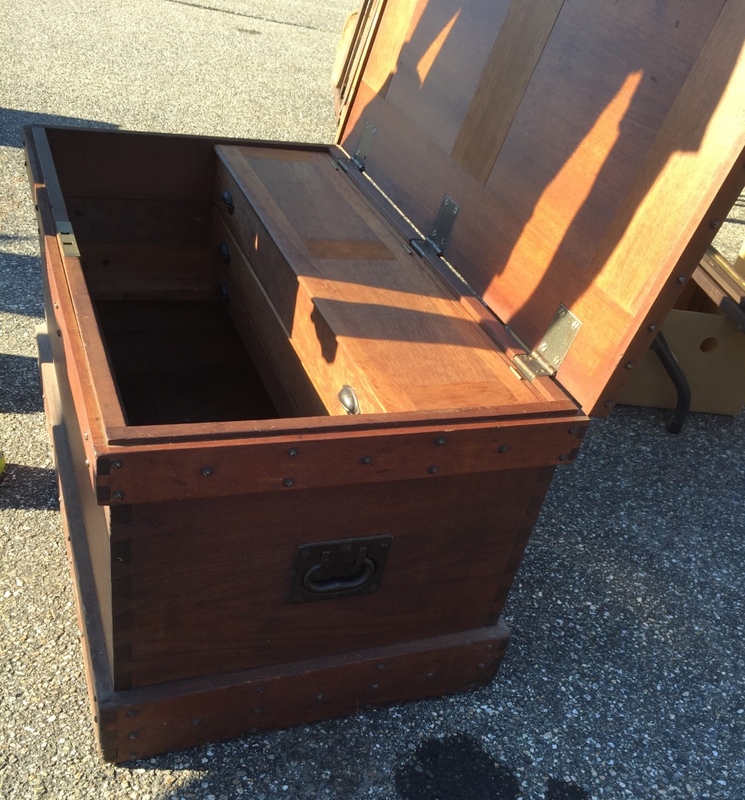 A view into the open chest. 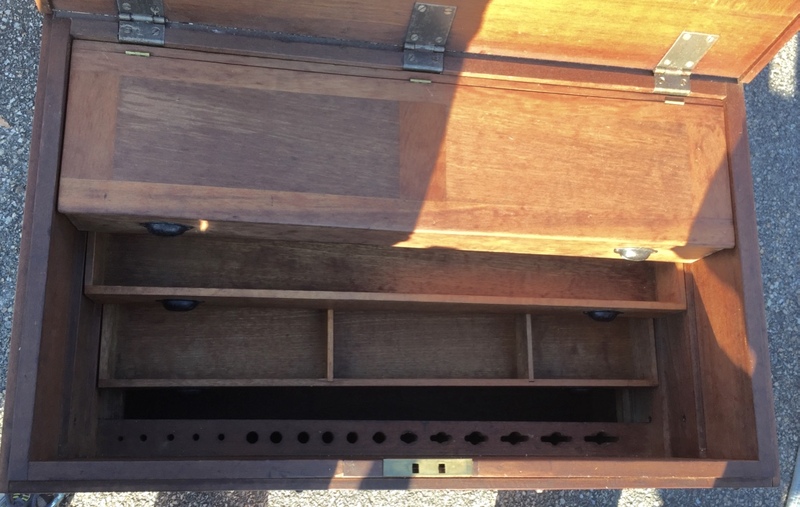 Interior of the chest. The lower tills were open trays. The top till had a lid and a single divider inside. On the front wall was a nice tool rack carefully sized for the various chisels and tools that once inhabited the chest. The hinges for the lid were also nice. 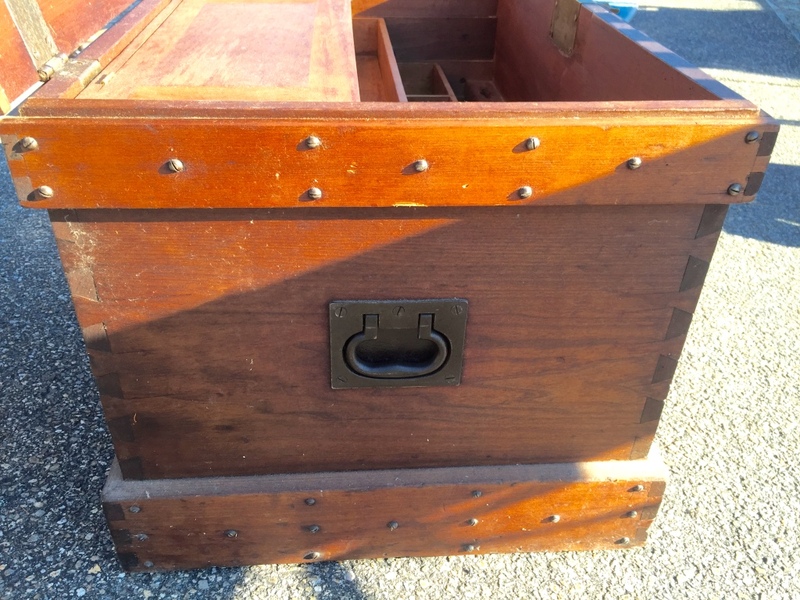 The lid also made liberal use of the round headed screws in an interesting pattern and likely helped protect the wood top as wood and other things were inevitably put on the lid and slid across the chest. The wood on the top looked to be in remarkably good shape. Above are some chests on display by Bill Garrett of Sparrowbush, NY. You may remember him from this earlier post. What I bought at the tool show this year. And now on to what I bought. I happy to say I didn’t spent too much this year and got some interesting items. From left to right: Some interesting books (The Barn, The First American Finishers Manual, The American Craftsman, and the Little Book of Early American Crafts &Trades). A new in package Bahco scraper, New in package Stabilia Torpedo Level (I’ve had one for years that lives in my toolbelt so its nice to have a spare/one for the shop), Ulmia Jointer Plane, ECE Shoulder Plane (Being of German Descent, and the fact that Americans don’t seem to like these sorts of plane, it has been interesting to collect and test out German style tools in my shop), Inside/Outside Calipers similar to what you see in the Studley Tool Cabinet, Dixon wood marking crayons donated by a friend, Paring Chisel with modern handle crammed on, a nice box of small carvers slip stones, a nice big gouge for coping when timber framing, and a very neat brass stencil given to me by Cynthia and George Short that says “W.W. & C.R. NOYES, 2388, BOSTON” that was likely used to mark crates or similar objects. As I have been reading up on Civil War re-enactors who build their own furniture, crates etc it was something I wanted to try out. So if anyone out there knows who the Noyes were or what they sold I would be interested to hear from you. The prior owners contacted some historical societies and didn’t get a firm answer. I’m hoping to use it as a model as I eventually want to make my own similar stencil with my own name on it. I’ll be sure to post about it. Canvas print of a group of carpenters and joiners. And last, but not least the photo above, on canvas, though a modern reprinting of an historic photo. 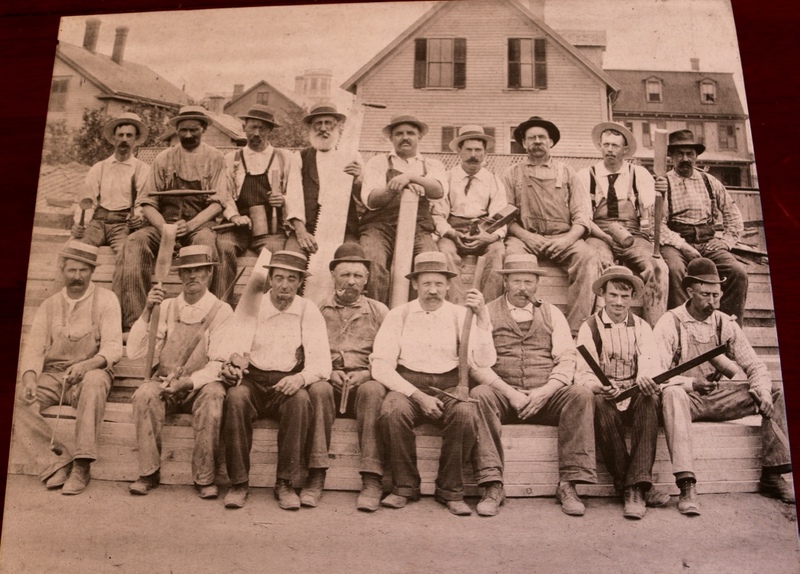 It’s a great shot of carpenters and joiners in the mid-late 19th century. I’m making that date assumption based on the architecture in the background and the more modern lumber they are sitting on. 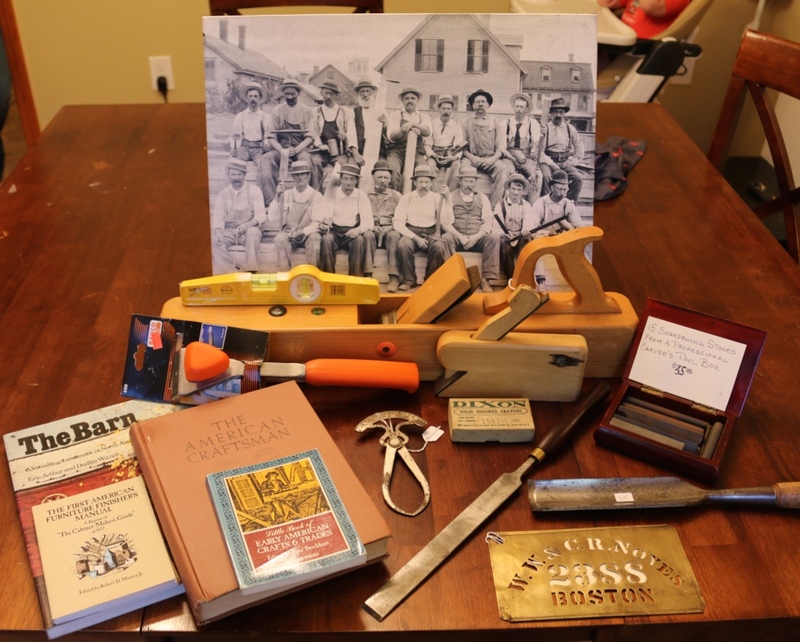 Even though they are sitting on a fairly modern looking lumber, likely to be used in a balloon frame, the men are holding slicks, mallets, draw knives, chisels of the scale used for timber framing, an earlier pre-bailey bench plane, framing square, bits with wooden handles, an adze, boxwood rules, a hand saw, a two man crosscut saw etc. It looks to be an amazing image of the time when things were transitioning from the old ways and heavy timber work to lighter construction methods. Other things of note in this picture are the various hats, pipes, aprons and overalls the guys are wearing. The guy in the first row, third from the left who looks like he’s in pretty rough shape. The well dressed man in the front row, third from the right with no tools in his hand — was he the owner? Or the foreman? Often the man with the framing square in a photo like this is the master, but the young man to the right of the well dressed man does not look like he’s the most experienced out of this lot. There is also an unusual building behind the head of the bearded man holding the two man saw that might help identify where this photo was taken. 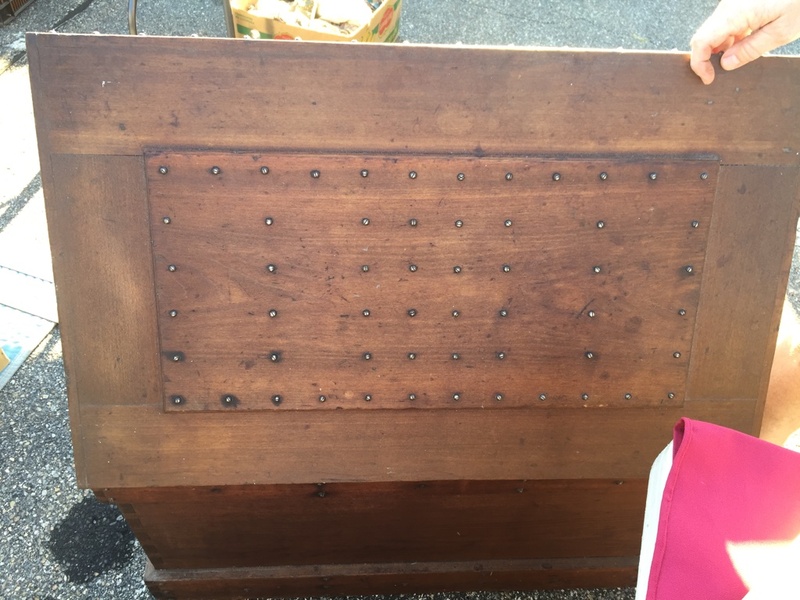 The seller thought it might be from southern MA, in the New Bedford or Fall River area. So if anyone has any further insights to add, please add them to the comments below. The photo opens up as many questions as it answers and will look nice hanging up out in my workshop. I hope to see you at the next Nashua tool show in April.